How much cereals (rice, wheat, millet, sorghum) and pulses do rural Indians consume in a month? In general, not anywhere near how much they should. The circles in this chart represent the rural population of 20 of India’s largest states by population. The National Sample Survey Office (NSSO) divides the rural (and also the urban) population of each state into tenths (they call them ‘deciles’), and the NSS surveys on consumption expenditure tell us how much each decile in each state spends, for example between Rs 800 and Rs 950 a month. I made this chart using data from the NSS report, ‘Level and Pattern of Consumer Expenditure’ (the 66th Round, which surveyed the population between 2009 July and 2010 June). 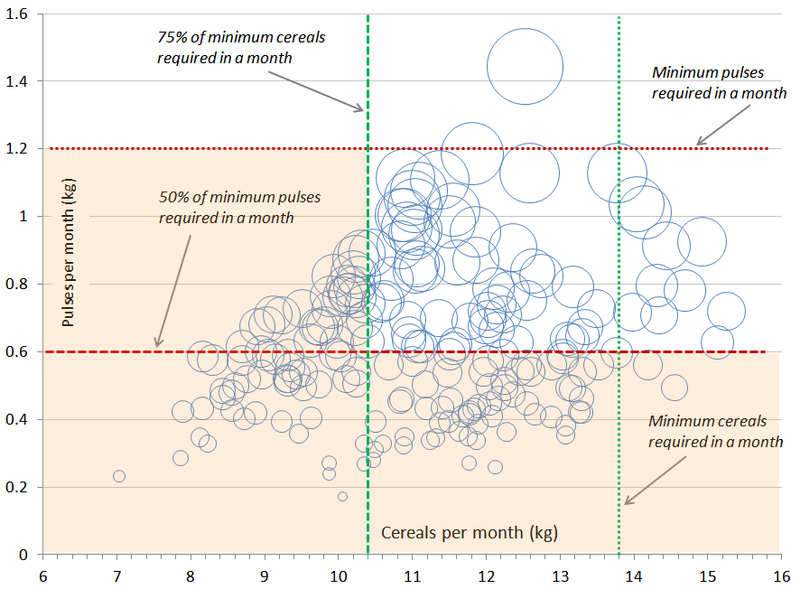 With 20 states and ten categories each, I had 200 readings to plot, examining the consumption in quantities for cereals and pulses. Depending on the population of the state, some of those circles represent 3-5 million people! Now here is the grim finding. Of these, 72 do not meet even 75% of the minimum cereals requirement (about 10.4 kg) a month, and 106 do not meet even 50% of the minimum pulses requirement (about 0.6 kg) a month – these are the National Institute of Nutrition recommended dietary allowances. And 43 of these deciles are severely deficient in both. How can the state explain the existence of these huge deficits in basic nutrition (see the coloured area of the chart, which includes tens of millions) while simultaneously chasing ‘growth’ as the means to remove those deficits? For the last week, there has been a great deal of comment and discussion about how the increase in expenditure – especially in rural India – is ‘evidence’ of increasing incomes, of widening prosperity and a general ‘lifting out of poverty’. It is misleading because neither the central government nor its supporters (there are many supporting views to be found in the media) has pointed out that an increase in expenditure will of course take place given the rise in the price of food and fuel. Comparing what the NSS has surveyed in 2009-10 with its 2004-05 survey, in some areas of expenditure the rupee rise is 300%-400% (such as for the eggs fish and meat, fresh fruit and beverages categories) and it will be useful to extract the quantities behind these increases in expenditure (I will get around to doing this as soon as possible). In any case, the quantities consumed for cereals and pulses have actually declined for rural and urban citizens. While the proportion of expense, out of total food expense (all-India figures for rural populations), on pulses and on milk (and milk products) has remained roughly the same – 5.6% to 5.2% and 15.3% to 15.2% – the proportion spent on cereals has dropped from 32.7% to 20.2%. I think this an extremely significant change that can be read together with the two big increases in proportion of spending – on egg fish and meat from 6% to 9% and on beverages from 8.2% to 15%. In the NSS definition, beverages also includes purchased meals and processed food, and it is this conversion of primary cereals (including coarse cereals) and pulses to processed foods that I see as an important factor behind the biggest change in the proportions spent on food in recent years. 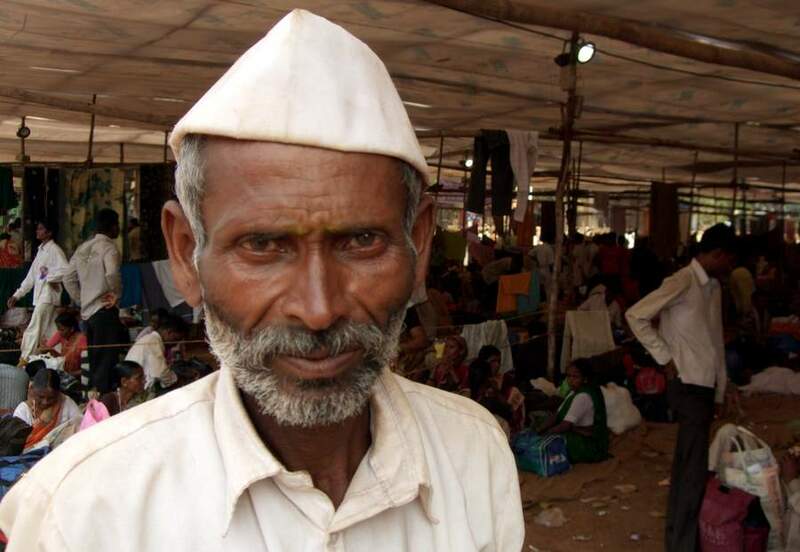 What do and what can rural residents spend on food and the essentials of living in India? This chart gives us an indication. It is based on new data contained in the latest revelation (my word, not theirs) from the National Sample Survey Office and is titled ‘Key Indicators of Household Consumer Expenditure in India’ (the 68th Round of sampling, for those who follow the extraordinary programme of this sterling statistical organisation). * That the average rural monthly expenditure per person was lowest in the states of Odisha and Jharkhand (around Rs 1,000) and also in Chhattisgarh (Rs 1,027). 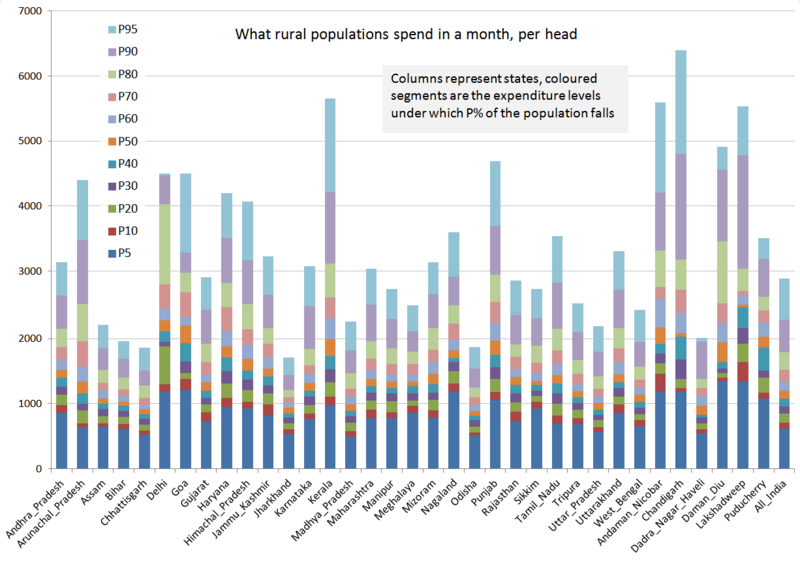 * In Bihar, Madhya Pradesh and Uttar Pradesh, the rural monthly expenditure per person was about Rs 1,125 to Rs 1,160. 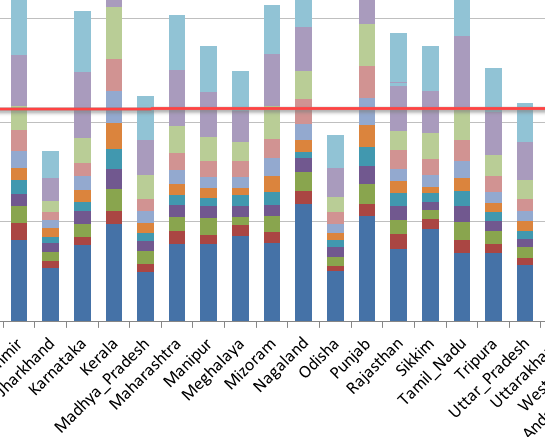 * In urban India (not shown in this chart, but I will add to this posting with an expanded update) Bihar had the lowest monthly expenditure per person (called monthly per capita expenditure by the NSSO and abbreviated to MPCE) of Rs 1,507. * In Chhattisgarh, Odisha, Jharkhand, Uttar Pradesh and Madhya Pradesh, urban MPCE was between Rs 1,865 and Rs 2,060. These six were the six major states with the lowest MPCEs for both rural and urban citizens. But those are averages, and in this data release, the NSSO has divided its usual ten deciles even further for the lowest and highest deciles. 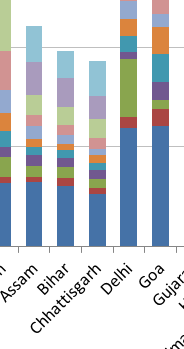 (The decile is the surveyed population divided into tenths, with these being classified by expenditure level.) Doing so gives us a better view of the elastic expense trends in the top ten per cent of the population, the class which is so pampered by the central government. For rural India then, the 5th percentile of the MPCE distribution was estimated as Rs 616 and the 10th percentile as Rs 710 – and these are all-India averages. 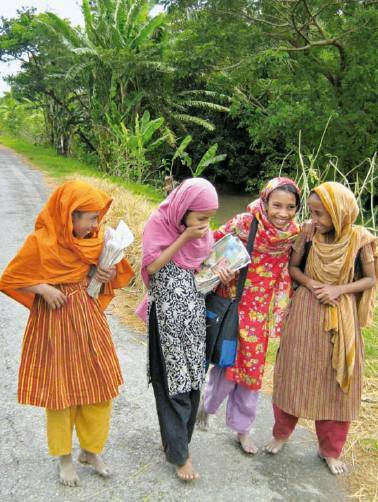 About half the total rural population is thus estimated to have a MPCE below Rs 1,198. Only about 10% of the rural population reported household MPCE above Rs 2,296 and only 5% reported MPCE above Rs 2,886 (this is using what is called the ‘modified mixed reference period’ or MMRP, in which the person interviewed is asked to recall purchases made over two different lengths of time, for different sorts of goods). The bottom-line is that food accounted for about 53% of the value of the average rural Indian’s household consumption during 2011-12. This included 11% for cereals and cereal substitutes, 8% for milk and milk products, another 8% on beverages and processed food, and 6.5% on vegetables. Among non-food item categories, fuel for cooking and lighting accounted for about 8%, clothing and footwear for 7%, medical expenses for about 6.5%, education for 3.5%, conveyance for 4%, other consumer services for 4%, and consumer durables for 4.5%. This ought to be a ringing alarm about access to food for the country’s planners, who are otherwise obsessed with GDP growth and whether India is cosmetically dolled up enough to attract global finance capital. It hasn’t sounded even a muted gong, and even if it had, one stunning inference from this table has been ignored – that this is an indicator of food and multi-dimensional poverty and that millions of rural residents are unable to afford food and basic services. How so? Look at the chart again. Imagine, at just above the line marking 2,000 rupees, a dotted red line at a level of around 2,070 rupees. That is the equivalent (before the recent fall in the rupee’s value against the US dollar) of USD 1.25 a day, which has (ill-advisedly) been cemented in development wisdom as a poverty line that can be applied in countries like India. 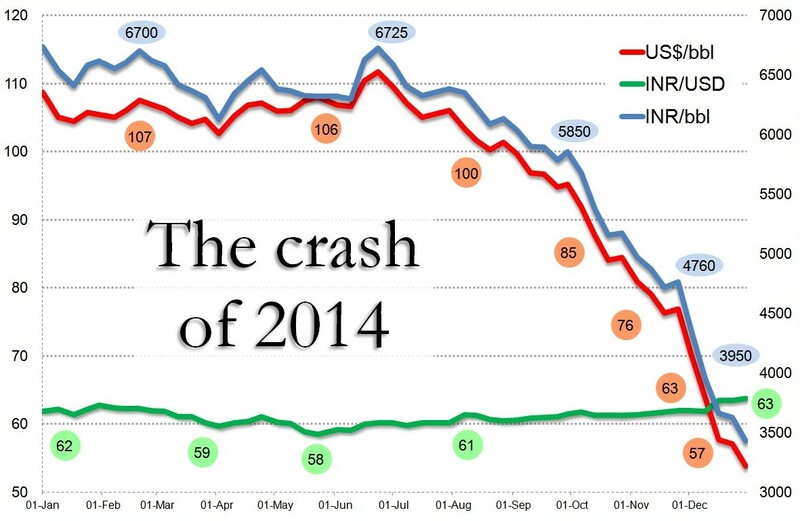 Let’s accept that in order to focus on what the new NSSO data tells us. At the Rs 2,070 level we see that for a relatively prosperous state like Haryana (a former Green Revolution state) about 50% of the rural population cannot spend, per person per month, this amount. The percentage of the rural population below and above this line is similar, more or less, for Punjab (also a former Green Revolution state) and for Kerala (which is not, but has income from economic migrants abroad). But the entire rural populations of Bihar, Chhattisgarh, Jharkhand and Odisha cannot spend this amount, because they do not earn it. How many is that? Using the 2001-2011 population growth rates (for rural populations of states) this means 98.96 million in rural Bihar, 20.65 million in rural Chhattisgarh, 26.52 million in rural Jharkhand and 36.19 million in rural Odisha are below this line. What of other states with large rural populations? In Assam, Madhya Pradesh, Uttar Pradesh and West Bengal, 90% of the rural population is below this line and that means 25.23 million in Assam, 49.90 million in Madhya Pradesh, 147.25 million in Uttar Pradesh, and 57.26 million in West Bengal. 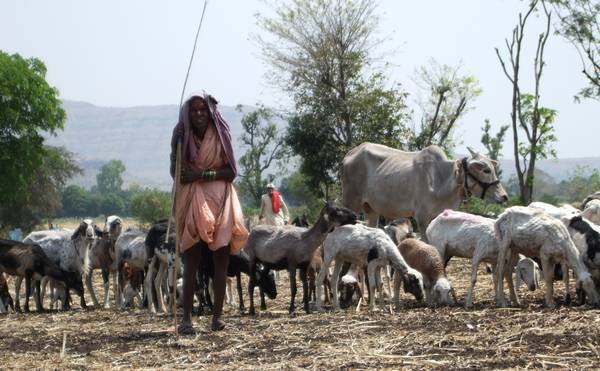 In Gujarat, Karnataka, Maharashtra and Rajasthan, 80% of the rural population is below this line and that means 28.52 million in Gujarat, 30.66 million in Karnataka, 50.77 million in Maharashtra and 43.55 million in Rajasthan. In Andhra Pradesh and Tamil Nadu, 70% of the rural population is below this line and that means 39.64 million in Andhra Pradesh and 26.56 million in Tamil Nadu. Taken together those rural populations are 681.72 million (more than twice the population of the USA). 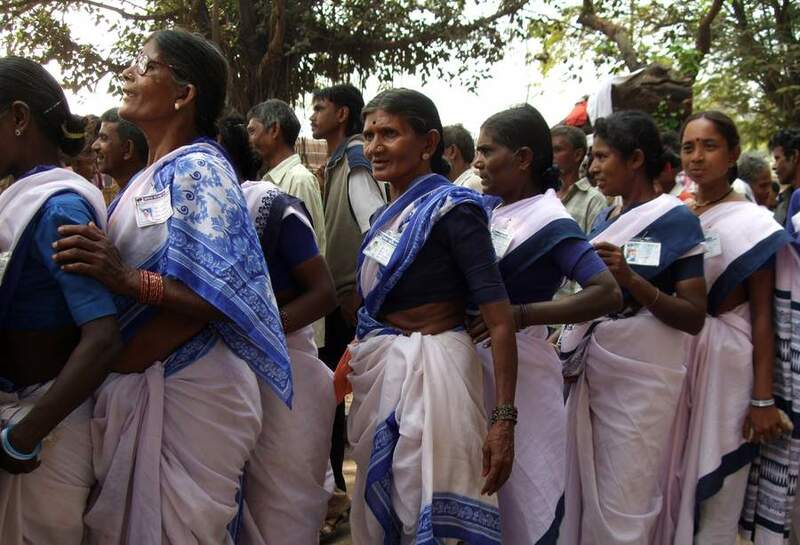 They are 78% of India’s 2013 rural population, almost eight out of ten rural citizens. The United Nations Conference on Trade and Development (UNCTAD), will hold the second Global Commodities Forum in Geneva on 2011 January 31-February 01. The rationale for the first Unctad Global Commodities Forum 2010 was described last year as centred on developing countries and their dependence on on commodities for their economic well-being. “As demand for commodities in the long term is going to increase, thus posing major challenges for their sustainable and efficient production, there is a very real need to consider how to make the commodities markets more stable and policies better designed, so that the benefits would be more equitably distributed between commodity producers and consumers.” Unctad’s GCF 2010 said then that it was important that an appropriate economic return could be delivered to commodities producers, many of whom are in developing countries. Policy actions to consider were said to include, inter alia, the development of policies to ensure that countries producing commodities do not face the so-called ‘resource curse’ and, of equal importance, measures that could be taken to mitigate or reduce the adverse effects of price and commodities market volatility, “which cause so much uncertainty and hardship to many of the most vulnerable people in developing countries”. Plenary A: The State of energy markets: lower volatility and a new price zone for hydrocarbons (A1), The state of agricultural markets: the drivers of increased volatility (A2) The state of selected metals market: fundamentals, non-fundamental factors and terms of trade (A3) Commodity markets’ volatility and interconnectedness (A4), Overcoming market volatility through better regulation, data and transparency (A5); Commodity policy challenges for oil and gas-exporting countries (A6) Commodity policy challenges for minerals and metal exporting countries (A7) Trade and other policy options for modernizing agriculture in developing countries (A8). Parallels B: Long-term sustainable supply & demand and technological innovation: hydrocarbons and other energy (B1), Long-term sustainable supply & demand in the energy sector: developing early warning systems (B2), New technologies and commodities: agriculture (B3) Long-term sustainable supply and demand and technological innovation and early warning systems for food security (B4), New technologies and commodities: energy (B5); Forecasting trends and strengthening early warning systems for producers, innovators and other supply chain participants (B6). Parallels C: Current trends and next frontiers for commodity finance (C1), The emerging regulatory environment and trade finance: new challenges and opportunities for banks and other financiers (C2), Support institutions for commodity finance (C3), Shipping and international trade in commodities (C4) Commodity futures markets: do they obscure underlying market realities, or provide long-term signals and management tools? (C5) Risk management in commodity markets: paper and physical markets and the realities of commodity exporters (C6). It’s up. Crude oil rose on speculation that growing French demand for imported fuel because of a strike will reduce stockpiles elsewhere, reported Bloomberg. France is importing “massive” amounts of fuel and tapping reserves to alleviate service-station shortages, Environment and Energy Minister Jean-Louis Borloo said today. The French government last week authorized the use of fuel reserves after Total SA announced it would halt its five active refineries in France and other refiners took measures to reduce output. Workers at the country’s 12 crude-processing plants have extended their labor action since Oct. 12 to protest a plan to raise the minimum retirement age. It’s up. Crude oil is poised to reach $90 a barrel by the middle of December, according to technical analysis by Lind-Waldock in Chicago. The December contract, which became the front-month contract yesterday, has been trading in an uptrend, a pattern of higher peaks and higher valleys, since touching a low of $75.10 on Sept. 23, Blake Robben, a strategist at Lind-Waldock, a division of MF Global Ltd., said in an interview. It’s down. Crude oil may decline next week after China’s oil processing grew the least in 18 months as government measures to cool the economy reduced fuel demand, a Bloomberg News survey showed. Fourteen of 30 analysts, or 47 percent, forecast crude oil will fall through Oct. 29. Eleven respondents, or 37 percent, predicted prices will be little changed and five estimated an increase. Last week analysts were split over whether futures would drop or climb. 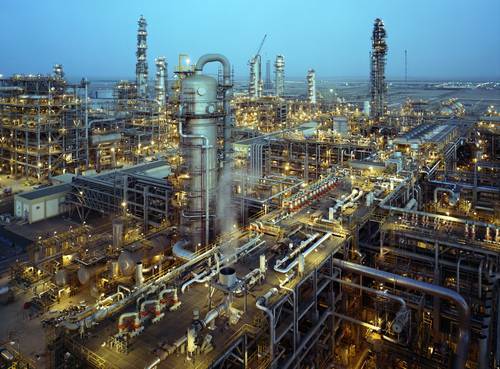 Data from the China Mainland Marketing Research Co. yesterday showed that refineries in the world’s biggest energy- consuming country processed about 8.5 million barrels a day in September. That’s a 6.6 percent gain from a year earlier, the smallest increase since March 2009. It’s down. Saudi Arabia has rejected claims that the era of cheaply produced oil is over, saying the world’s largest field in the kingdom’s eastern province still holds more than many countries. Many of the largest oilfields in Texas and the North Sea have passed their prime, forcing companies to target more costly prospects such as bitumen deposits in Venezuela, Canadian tar sands and ethanol. 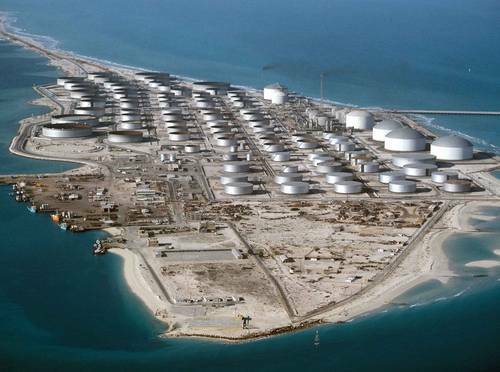 But Ali al Naimi, the Saudi Arabian oil minister, pointed to the Ghawar field’s 88 billion barrels of remaining reserves and the kingdom’s large cushion of spare pumping capacity as signs that oil was still abundant. “”I am sorry to disappoint people but the era of easy oil is not over,”” al Naimi said at a conference held in the Saudi capital to celebrate the 50th birthday of OPEC. “”How can you say the era of easy oil is over when we still have 88 billion barrels in the Ghawar field? That is more than many countries in the world. You can dismiss the notion that easy oil in Saudi Arabia is gone.”” The Ghawar field, measuring 280km by 30km, is by far the largest conventional oilfield in the world. 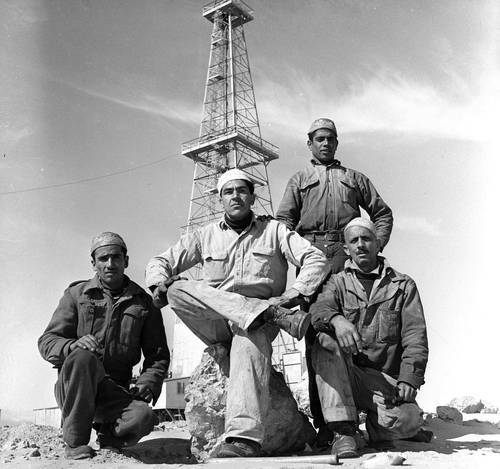 Although details of the field’s performance are not made public, it is believed to have produced more than 65 billion barrels already since production began in 1951. It’s up. Any oil price fall should be seen as an opportunity to buy the contract as the next move in the market is likely to be a rally, JPMorgan Chase & Co. said.“The signal that the next leg higher is imminent will be tighter Dubai forward spreads and a narrower Brent-Dubai spread,” Lawrence Eagles, head of commodity strategy in New York, said in a monthly oil market report. JPMorgan said it expects the dollar to weaken by four to five percent over the next six months, giving oil a boost. A declining dollar increases the appeal of energy as an inflation hedge. The strength in crude is also bolstered by rising demand in several regions, the bank said. A narrowing spread, when Dubai oil rises closer to North Sea Brent, typically shows increasing Asian demand. The Brent-Dubai exchange for swaps, or EFS, for December narrowed 12 cents to $2.40 a barrel today, according to data from PVM Oil Associates. The EFS is the price difference between Brent futures and Dubai swaps contracts and signifies Brent’s premium relative to the Middle East grade. The December-January Dubai spread shrank to minus 36 cents from minus 80 cents on Sept. 27, according to data compiled by Bloomberg. “The key risk is that we are being too cautious and that the threat of $100 a barrel oil that is implicit in our fourth- quarter 2011 oil forecast arrives much sooner than we expect, driven by not only a weak dollar, but also by rampant Chinese and emerging market demand, the rebuilding of French strategic stocks, and an upward bias to food prices,” Eagles said in the report. The question in Asia again is food inflation. Entering the last quarter of 2010, news reports from South and South-East Asia cite continuing high food inflation as a persistent worry for consumers. The food weighting in Asia’s consumer price indexes is mostly high. China, India, Indonesia and Thailand have CPI weightings of 33%-46% for food. China, India and Indonesia together account for 40% of the global population. Any small increase in demand from these countries in the form of imports tends to push up global prices. The recent crop failure in India and its attempt to import sugar are a case in point. Moreover, there are some crops that are peculiar to local markets with very little global supply. For instance, in the case of India last year, the country fell short of pulses (lentils), and it was not really possible to import the crop even if the government had wanted to. Indeed, the top four (in terms of population) countries in the region (China, India, Indonesia and Thailand) are all net exporters of food items. All four countries tend to maintain inventories for staple items like rice and wheat, and have public distribution systems to ensure availability of these essential items at a reasonable price. Most countries in the region subsidise food for the poor. Against this background, two recent speeches from senior figures in India’s central bank, the Reserve Bank of India, are worth examining closely. First, in ‘Managing the Growth-Inflation Balance in India: Current Considerations and Long-term Perspectives’ the deputy governor of the RBI Dr Subir Gokarn talks directly about food inflation (he gave the speech on 05 October 2010 at The Private Equity International India Forum). Next, in a speech titled ‘Perspectives on Inflation in India’, executive director of the RBI, Deepak Mohanty (on 28 September 2010 at the Bankers Club, Chennai) said that the Reserve Bank is concerned over “the unacceptably high inflation rate”. Mohanty dwelt awhile on the Indian government’s new wholesale price index series. What is curious is that these trends have taken place during a phase of rapid growth in India’s formal economy. Gokarn explained that what was most significant from the monetary policy perspective was the growing visibility of demand-side pressures. He examined the price dynamics of the manufacturing sector – overall and without the food processing component. The latter, he said, has been used by many analysts as a reasonable proxy of demand-side inflation, which is the phenomenon that monetary policy can and should influence. Both sectors he said, and particularly non-food manufacturing inflation, “show a tremendous acceleration from a significantly negative rate of inflation during 2009 to reach rather worrisome levels by the middle of 2010”. Mohanty finds that the new series of WPI inflation marks a major change in terms of scope and coverage of commodities and is more representative of the underlying economic structure. As per the new series, the manufactured products inflation is lower than what was seen on the basis of the old series, he said. The food price inflation, on the other hand, is higher than what was seen on the basis of the old series. “The high level of food prices is indeed a matter of concern as the prices of protein-based items, which have a higher share in the consumption basket, are showing larger increases”. Moreover, Mohanty said, there is continuing shortage of food items such as pulses and edible oils. “If the supply response doesn’t improve, there is a risk that food price inflation could acquire a structural character”. The decision of the UPA government to inflict a steep rise in the prices of petrol, diesel, kerosene oil and cooking gas is a cruel blow against the people who are already suffering due to the runaway increase in the prices of food and essential commodities. The price of petrol has gone up by Rs. 3.50 per litre, diesel by Rs. 2 per litre, kerosene oil by Rs. 3 per litre and cooking gas by Rs. 35 per cylinder. This callous decision of the government has come at a time when the food inflation rate is around 17 per cent and the general inflation rate has reached double digits. India has the dubious distinction of having the highest rate of consumer price inflation in the world. The UPA government has decided to deregulate the price of petrol and leave it to the market to determine. Going by the Kirit Parikh Report, the government is going to decontrol prices of all petroleum products, including diesel. This is going to prove disastrous for the economy and the country. The government is giving false arguments to justify these measures. The prices of petrol and diesel were increased by Rs. 3 per litre only three months ago at the time of the Union Budget. International oil prices have not risen substantially in this period. Neither is the government prepared to rationalize the taxation structure on petroleum products which is adding to a price of petrol and diesel in a large measure. It is a myth that such a step is being taken to protect the public sector companies from under-recoveries. The so-called under-recoveries are entirely based on notional prices calculated without any reference to the actual cost of production. In fact, the deregulation is only to help private companies who withdrew from the market because of the government price controls. Now they will be free to enter the market to make profits. By deregulating petrol prices, the government has opened the way for continuous increases in the prices of petrol. By increasing the price of diesel and kerosene oil, the farmers and the poorer sections are going to be badly hit. The LPG increase will further burden the middle classes. The Congress-led government has shown its callous and anti-people character by these measures. The Left parties demand the immediate scrapping of the price increases. They call upon all their units to jointly launch protests against these hikes. 1. Average Monthly Per Capita Consumer Expenditure (MPCE) in 2007-08 was Rs.772 in rural India and Rs.1472 in urban India at 2007-08 prices. About 65% of the rural population had MPCE lower than the national rural average. For urban India the corresponding proportion was 66%. 2. The survey estimated that in 2007-08, around one-half of the Indian rural population belonged to households with MPCE less than Rs.649 at 2007-08 prices. In 2006-07, the corresponding level of MPCE for the rural population had been estimated as Rs.580. 3. In urban India, one-half of the population belonged to households with monthly per capita consumer expenditure less than Rs.1130. 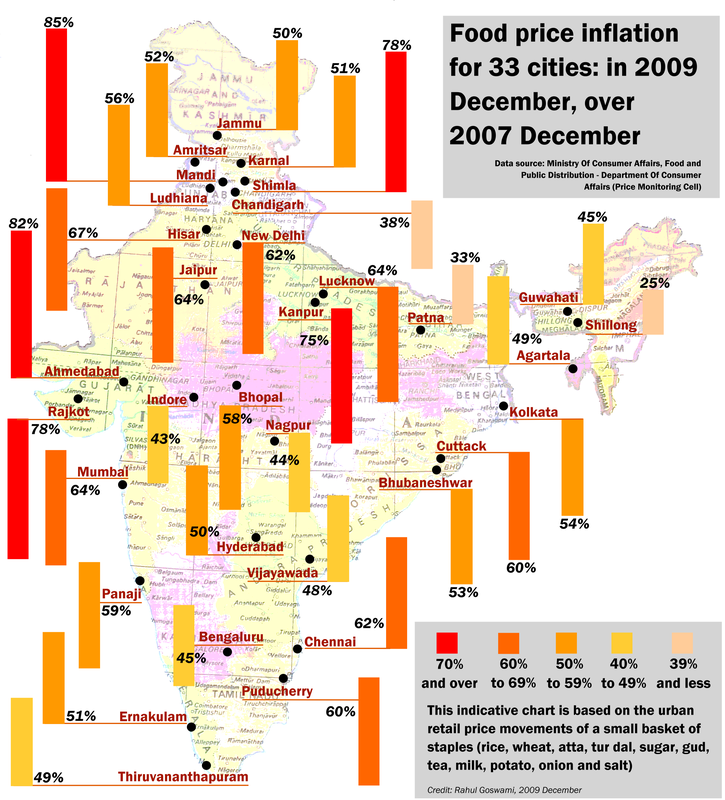 In 2006-07, the corresponding level of MPCE for the urban population had been estimated as Rs.990. 4. About 10% of the rural population had MPCE under Rs.400. 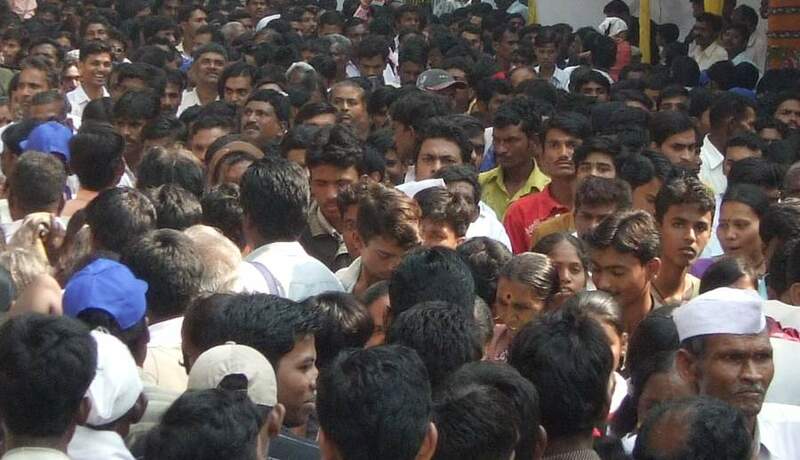 The corresponding figure for the urban population was Rs.567, that is, 42% higher. At the other extreme, about 10% of the rural population had MPCE above Rs.1229. The corresponding figure for the urban population was Rs.2654, that is, 116% higher. 5. Real MPCE (base 1987-88) was estimated to have grown by about 21% from 1993-94 to 2007-08 (that is, over a 14-year period) in rural India and by about 36% in urban India. The annual real terms increase from 2006-07 to 2007-08 in average rural MPCE was 2.2% and in average urban MPCE was 5.4%. 1. Out of every rupee of the value of the average rural Indian’s household consumption during 2007-08, the value of food consumed accounted for about 52 paise. Of this, cereals and cereal substitutes made up 16 paise, while milk and milk products accounted for 8 paise. 2. Out of every rupee of the value of the average urban Indian’s household consumption during 2007-08, the value of food consumed accounted for about 40 paise. Of this, cereals and cereal substitutes made up 9 paise, while milk and milk products accounted for 7 paise. 3. While the share of most of the food item groups in total consumption expenditure was higher in rural India than in urban India, fruits and processed food were exceptions. 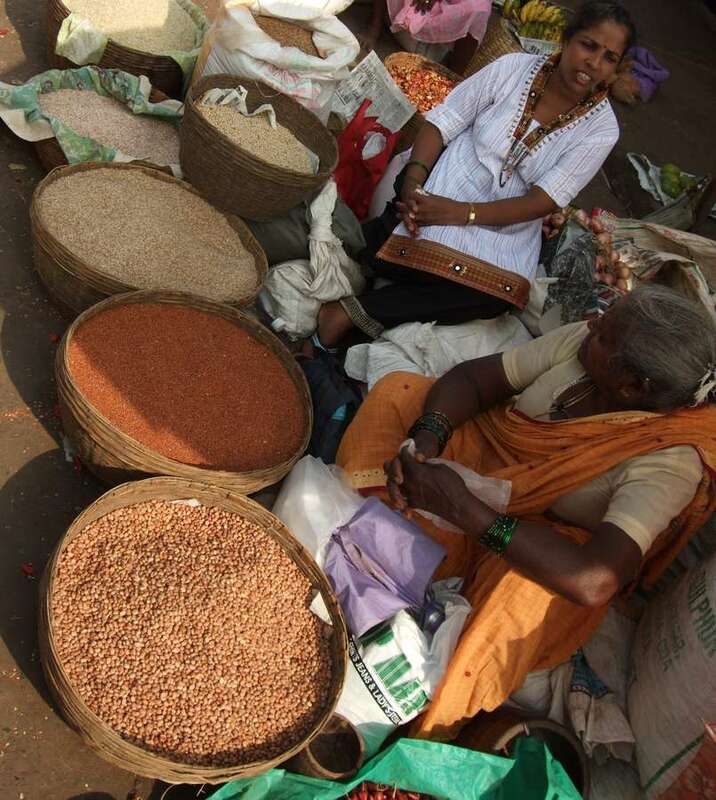 For non-food item groups, the share was usually higher in urban India. The noticeable differences were in case of rent (urban share: 6%, rural share: 0.4%), education (urban: 7%, rural: 3.7%), consumer services other than conveyance (urban: 7.8%, rural: 4.5%), and conveyance (urban: 6.4%, rural: 4%). 4. The share of milk and milk products in total consumption expenditure was found to rise steadily in rural India with MPCE level from under 3% in the bottom decile class to nearly 10% in the ninth decile class. The share of fuel and light was about 12% for the poorest decile class of the rural as well as of the urban population and fell steadily with rise in MPCE to 7% for the top decile class in rural India and to 6% in urban India. 5. 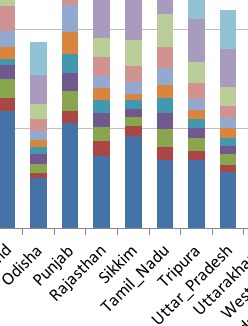 The share of food in total consumption expenditure of rural households varied among the major states from 41% for Kerala and 44% for Punjab to 58-60% for Orissa, West Bengal, Jharkhand, Assam and Bihar. In the urban sector the share of food expenditure varied between 36% (Kerala and Chhattisgarh) and 47% (Assam and Bihar). 6. Tobacco was consumed in as many as 61% households in rural India compared to 36% households in urban India. 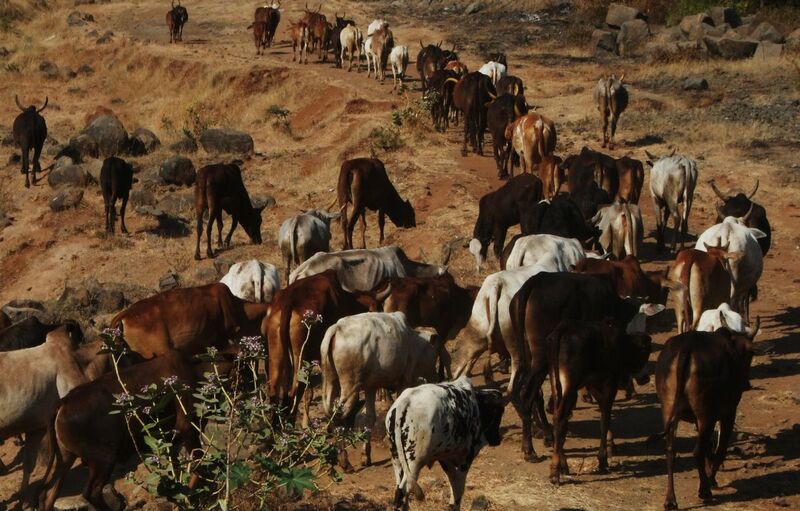 About 62% of rural households and 59% of urban households were estimated to have consumed egg, fish or meat during the last 30 days. In non-food items, consumption on account of entertainment was reported by 28% of rural households and 63% of urban households. Consumer expenditure for rent was reported by only 7% of rural households and 38% of urban households.